I need to take a break from the internet. Mostly for work, but also to give some thought to the future, make some decisions, and get my writing life where it needs to be. My creative batteries are also much in need of recharging, too. Since summer is my favorite season it's a good time for me to get away from the computer and enjoy it a little. Also helps me avoid that "Delete Your Blog" button that sometimes looks so very tempting even after twelve years of doing this. 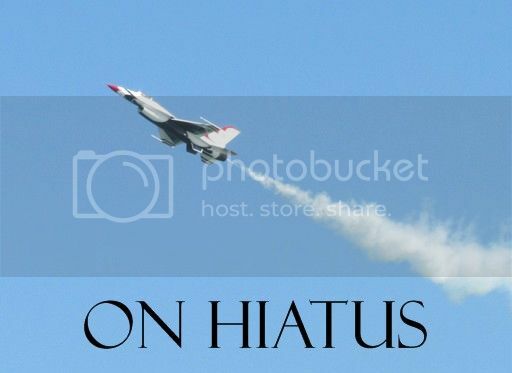 As for the length of my hiatus, right now I'm thinking a month will work nicely. If I decide to extend it longer than that I'll post an update in August. Please don't worry about me, and thanks in advance for understanding. See you in a few weeks. Summer vacation! Have a great one! Your journal week was a wonderful inspiration to me, I've started journaling in my own way as a result. I'll miss you (maybe you could finish Nex's story for us??) but wish you all the best. I hope the GoodRead trolls did not ruin it for the rest of us. I'm so glad you're journaling! And I will be working on Nex's story while I'm on hiatus. I don't know if I'll finish it, but expect a hefty number of pages in the near future. Trolls generally lose interest after they don't get whatever train wreck they were trying to provoke, so I'm not worried. I vote never to delete your blog. I would sorely miss it. I'm sweltering here in sympathy, when I'm not squishing around, that is. I would read the hell out of that. LOL. I will definitely do both, lady -- thanks. Enjoy your blog holiday. I'll miss reading you and vote to remove the delete button. I also admit to a fascination with reading those memoirs. Have a good break. Thanks, Fran -- I hope all settles down on your side of the pond soon, too. Enjoy your break. Adding my plea to never delete your blog, if possible. It's one of the rocks of my world. Me too. Adding my plea to not delete your blog. It's also a pillar of my world. I've been following your blog for most if not all of the twelve years it's been around, and the thought of its disappearance is distressing. Even if you no longer want to add to it there is so much useful, inspiring material in the archives, I would be very sorry to lose access to it. Thank you so much for all of it. If you don't want to blog so much (after your break), you could cut back to once or twice a week or just whenever you have something to share (always gratefully received). Anyway, best wishes for a restful, refreshing break.